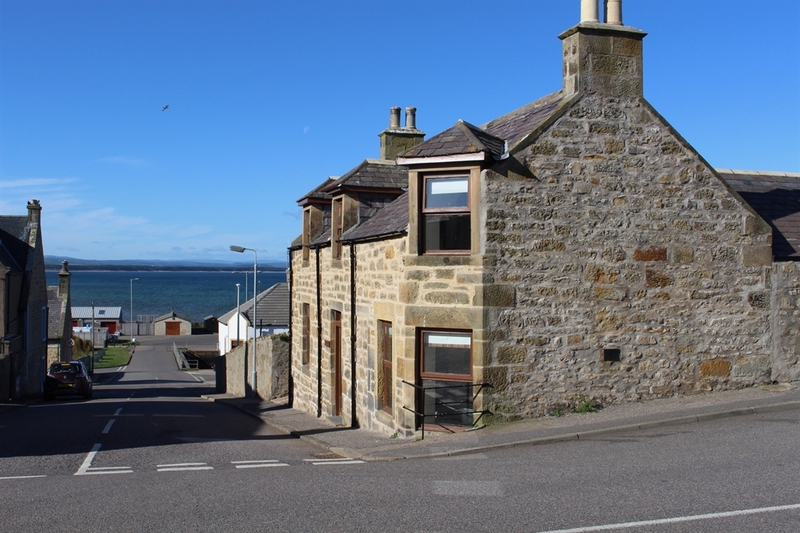 Luxurious newly decorated cottage with sea views from house and garden. Beside harbour and seven miles of beach in the historic town of Burghead. Burghead is built on a Peninsula with a sandy beach on one side, a rocky beach on the other side and a Viewpoint Tower right on the tip which is a renowned spot for whale and dolphin spotting. Coastal path and forest for walking and cycling. Pubs and restaurant a couple of minutes walk away. Beautful detached stone built cottage sleeping eight people. Large walled garden with off street parking for two cars plus plenty of on street parking if required. Quality furnishings and fittings with underfloor heating throughout the ground floor and central heating upstairs. Oak wooden flooring on ground floor apart from Utility room and Shower room which are tiled. New, luxury soft carpeting fitted upstairs. Two twin bedrooms downstairs. Upstairs there are two double bedrooms (one en-suite) and a family bathroom with a large shower cubicle and a corner bath. One of the double bedrooms has a feature porthole window looking out to sea. Kitchen/diner with Range cooker and Belfast sink. Large Utility/Boot room with wet floor Shower room off, boot rack and coat hooks. Wood burning stove in sitting room to cosy up to on cooler days with plenty of logs available from our outside log store. Plenty of games, CDs, books and DVDs. Sony Audio System with Bluetooth, CD player, USB playback and DAB Radio. On warmer days, when you have had enough of the seven miles of beach, open up the kitchen patio doors and make use of our large patio area with garden furniture and a barbecue. Sit and relax and enjoy the beautiful sea view. You may see dolphins, seals or even a whale. The combination of the wonderful situation of this house plus the fact that it is equipped to a very high standard makes it a very special place that we know you will enjoy as much as we do.